Fading 5 (This enchantment comes into play with five fade counters on it. At the beginning of your upkeep, remove a fade counter from it. If you can't, sacrifice it.) 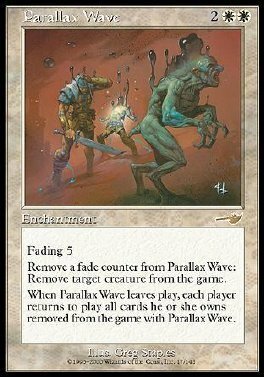 Remove a fade counter from Parallax Wave: Remove target creature from the game if Parallax Wave is in play. When Parallax Wave leaves play, each player returns to play all cards other than Parallax Wave he or she owns removed from the game with Parallax Wave.